This is one of the two articles that bring us Dynamic Data Masking solutions: (1) Using Security layer, which is this article, and (2) Using SQL Server 2016 new feature. Both articles use the same introduction and preparation. If you already created all the basic elements from the other article, then you can jump to the next section: Building Security layer. Dynamic data masking (DDM) is a solution that aims at real-time data masking of production data. DDM changes the data stream so that the data requester does not get full access to sensitive data, while no physical changes to the original production data take place. DDM does not intend to fully prevent unauthorized access to sensitive data. For this we can revoke any use of the data, on database level, on elements level (table, view, functions, etc. ), on rows level (built-in from SQL 2016 version), on columns level, etc. By revoking permissions to use the data, any attempt of using the unauthorized data will raise an error. Instead of fully preventing unauthorized access to sensitive data, DDM gives us solutions to expose some of the information, while masking the rest. This allows us to determine how and which parts of the information will be exposed. For example, a client service operator at a call center may identify callers by the 4 last digits of their Credit Card number. Therefore, we do not want to fully prevent access to the sensitive data (credit card number). We need to expose this part of the data (the 4 last digits), but at the same time, the credit card number should not be fully exposed to the operator. In other words, we want to mask part of the data while exposing other part of the data. There are several ways we can implement Dynamic Data Masking, for example: (1) creating policy-based security layer at the Database level, (2) using policy-based security Feature at Database level(This feature was added to SQL Server 2016), (3) using external intermediate layer between the server and the client like proxy, and (4) using external security layer in the application level. 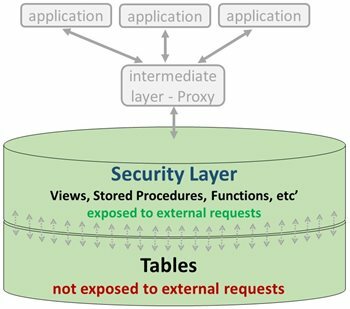 Designing external security layer in the application level is a common scenario for application’s architecture. This solution based on the assumption that our data available only throw our application. In reality this is probably not the case! This solution leaves the data unsecured, if users access tables directly rather than through the given application. A security layer best enforce the security rules in the database level. Moreover, forcing the security rules in the database level has minimal impact on the application layer, and it is behave like a “black box”. In this article we will focus on creating policy-based security layer at the database level. This can be achieved using elements like Views, table-valued functions, Triggers, Stored Procedures, etc. You can download the entire code presented in this article, as part of zip file that includes lecture material presented at the Microsoft offices in Israel. The lecture was about "INSTEAD of TRIGGER" and that code was presented towards the end of the lecture. In order to implement policy-based security we need to create a new database user. It is highly recommended for most cases to use operating system user (WINDOWS USER), but for the sake of this example we will start with creating new CREDENTIAL which use IDENTITY that we did not created. Next, we will create new SQL Server LOGIN, which associated to the CREDENTIAL. And last, we will creates a new Database User for our LOGIN. -- in order to isolate the application requirements (isolate operating system resources). -- required to connect to a resource outside SQL Server. -- to access resources outside the server instance. -- If there is no login mapped credential for the provider, the credential mapped to SQL Server service account is used. The primary idea of security layer is not to open any privilege on the data layer. The data layer, which in database includes the tables that stores the data, should not be accessible. Instead we create other elements like Stored Procedures, functions, Views that expose the data. These elements are our security layer and we grants permissions to users to access and to use these elements. For our demo, we will create two elements in the security layer: (a) an Inline User-Defined Function that select the data from the original table (our DATA layer), but returns the information masked, using any format that we want. (b) A View that use the same query as the function above, and returns the data from the DATA layer after masking, using the same logic. Next we will create INSTEAD of TRIGGER in order to deal with DML request that come throw the VIEW. Last step, is to grant the user/s permissions to use the security layer, which means that we expose these elements to external requests. -- * View can have expressions other than simple column name. -- In these cases, we have to use INSTEAD of TRIGGER, in order to update the table through the view. In order to show the power of Dynamic Data Masking you can open two connection to the database, one connection with your main user (the user that have full permissions), and one connection using the new LOGIN that we created in this article. Another option is just using your main user and execute frst test as current user and use impersonating to the new user that we created using "EXECUTE AS" For the second test. 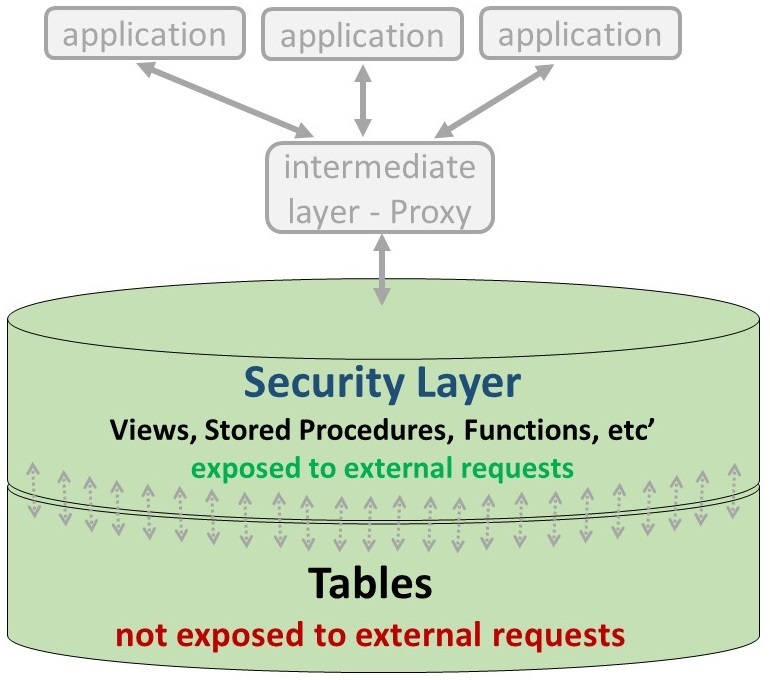 Designing external security layer in the application level based on the assumption that our data available only through our external security layer. This solution leaves the data unsecured, if users access it directly rather than through the security layer! 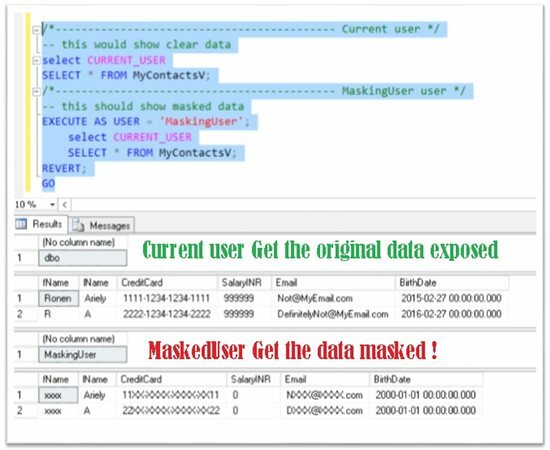 SQL Server version 2016 brings us a new feature: Dynamic Data Masking. As mentioned above in the introduction this feature gives us a Database level policy-based security Feature. Creating Security layer enable us to expose the data in any format that we want, using any function that we want, including SQLCLR elements. It is much more flexible than the built-in solution in SQL 2016. Creating Security layer must expose any DATA that we need to use. This procedure might be time consuming. If our only purpose is masking the data the built-in solution in SQL 2016 gives us much faster and simpler solution. You can download the entire codes presented in this article, as part of zip file that include lecture material that was presented at Microsoft offices in Israel. The lecture was about "INSTEAD of TRIGGER" and these codes were the last example that presented. In this article we showed simple way to create a "Dynamic DATA Masking" solution, based on internal security layer. The security layer was achieved by restricting any direct use on the tables, and by granting permissions on the security layer's elements. In this way, the security layer is exposed to external requests while the original data inaccessible. Our security layer based on creating elements like Views, table-valued functions, Triggers, Stored Procedures, etc. These elements uses the original DATA, and returns masked data in any format that we chose.